Facebook much? Well, here’s an interactive music video that will make you re-think your relationship with the world wide web. Facehawk, directed by Rajeev Basu for Big Data, reflects on voyeurism in the digital age. Replicating the Facebook environment (but without actually posting on Facebook) the interactive promo serves as a reminder that it’s not just us doing the watching. We are, in turn, watched, monitored, and recorded. Rajeev was nice enough to answer a couple of questions about Facehawk. Q: What is the technology behind your music video? RB: Facehawk makes use of several progressive technologies. We used the Canvas API, three.js, Facebook’s OpenGraph, the SoundCloud API, and SVG. We believe we’re also one of the first to render HTML code like facebook statuses into 2d graphics on the fly, so they can be animated in your browser. The biggest challenge was finding a way to animate hundreds of photos and statuses in your browser, on the fly. We had to go through dozens of prototypes, but we found a way. Q: Is Facehawk dependent on the number of things one posts on his profile? RB: The actual number of pieces that makes up your hawk is generally very similar across all users. The reason is that if we have trouble accessing your photos and statuses, say because you don’t have enough, or you have tight privacy settings on your account – we can dive further through your account into your friend’s accounts and pull out their info. It’s pretty creepy, and intentionally so, but shows just how accessible all this data is. Q: Can you post the final picture of Facehawk on Facebook? RB: This is something we thought of doing initially, but there are a lot of privacy and security issues related to it. 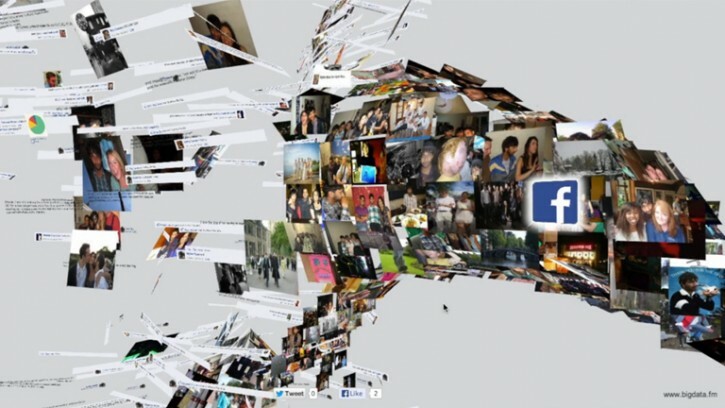 As the hawk is made up of photos and statuses of both you and your friends there is a permission issue. Then, there is a general browser security block which prevents the code from taking a screenshot the final page, which is actually a good thing. You wouldn’t want the browser to be capable of taking a screenshot of your page when you were putting in your bank details. Q: How did the collaboration with the band go? RB: Alan from the band saw some of my previous work (dronesofnewyork and tumbly.at) and threw out the idea that we should collaborate on something. After we got chatting we discovered that we shared a similar way of thinking. We liked creating stuff that messed with people. He sent me the yet to be released single “Dangerous”, to which I created the treatment for facehawk a few days later. Then we got rolling right away. Q: What do you think about interactive music videos in general? RB: I think it’s a very exciting time for music videos, and I love seeing all the creativity and innovation. I do however feel like it has become a bit of a trend where labels or artists simply want one for the sake of wanting one. And that’s without thinking of how an interactive video, or game, or web toy, could smartly link to their song or message to create something that will genuinely cut through. One of my favourite pieces of music promo/art wasn’t a video, but this game for Skrillex. It stands out to me as a smart, well crafted piece of content. And rightly so, it got shared by thousands!